Whether you want to fake a side dish or a full meal, many cities offer terrific take-out options, from traditional (roast heritage turkey from San Francisco's Bi-Rite) to neo-traditional (Eataly's popular turkey porchetta). 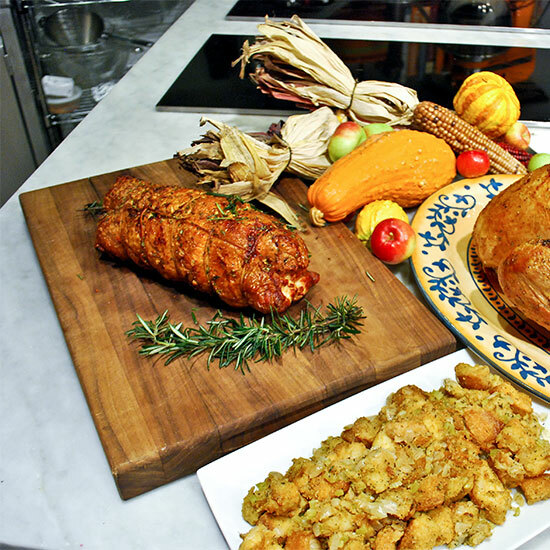 What to Order: Turkey porchetta with a turkey-sausage stuffing ($11 per lb). eataly.com. What to Order: Whole fried turkeys ($75.50 for 10 servings) with seasonings like Cajun spices and spicy jerk sauce. jiveturkey.com. What to Order: Meals ($170 for 8–10 servings) or à la carte, including BN Ranch turkeys from Bill Niman's personal breeding flock ($7 per lb) and crab bisque with preserved Meyer lemon ($13 per qt). biritemarket.com. What to Order: Meals ($100 for 8 servings) that include local turkey breast, Swiss chard stuffing and Zinfandel-spiked cranberry sauce. agferrari.com. What to Order: Whole Locavore pies ($20) like pear-raspberry, walnut and vegan apple-cranberry. missionpie.com. What to Order: Meals ($35 per person) that include herb-roasted turkey breast or a savory vegetarian pie with mushroom gravy, plus sides like sweet potato casserole. 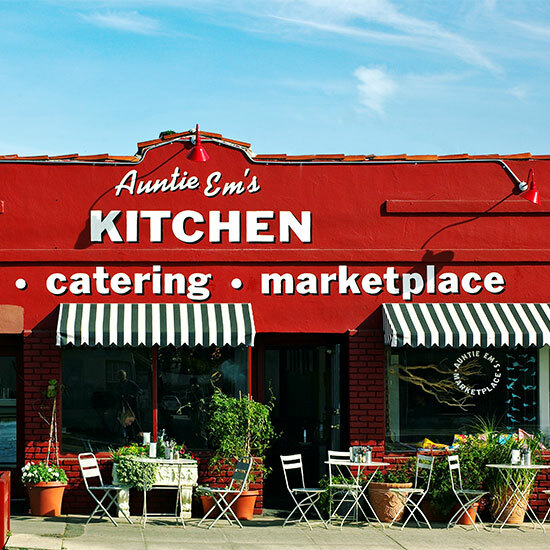 auntieemskitchen.com. 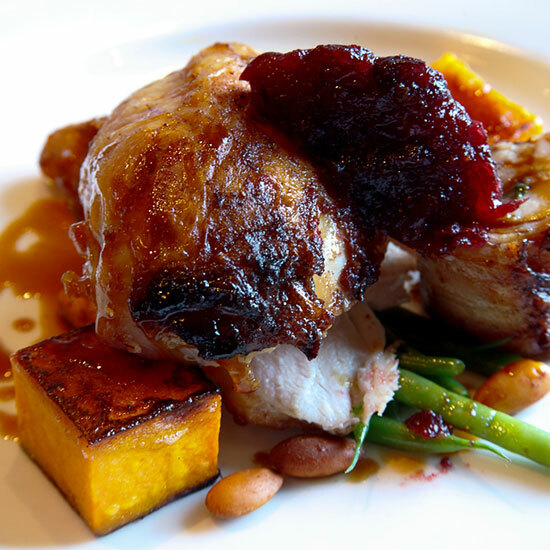 What to Order: Packages ($37 per person) featuring brined organic turkey, glazed carrots and apple crisp. churchandstatebistro.com. What to Order: Pecan-wood-smoked turkey with cornbread stuffing, cranberry sauce and gravy ($100 for 15–18 servings). À la carte sides include braised greens, baked beans, red beans and rice. gussbbq.com. What to Order: Wild mushroom soup with thyme ($16 per qt), Maine lobster tails with curry ($38 per lb) and Nueske's spiral cut ham ($26 per lb). Also, smoked-salmon platters with or without osetra caviar ($135–$235). charlietrotters.com/togo. What to Order: Mini pumpkin risotto cakes ($24 per doz), spinach gratin with Gouda ($8.50 per lb) and brined, butter-basted turkeys ($90–$120 for 12–14 lbs). goddessandgrocer.com. 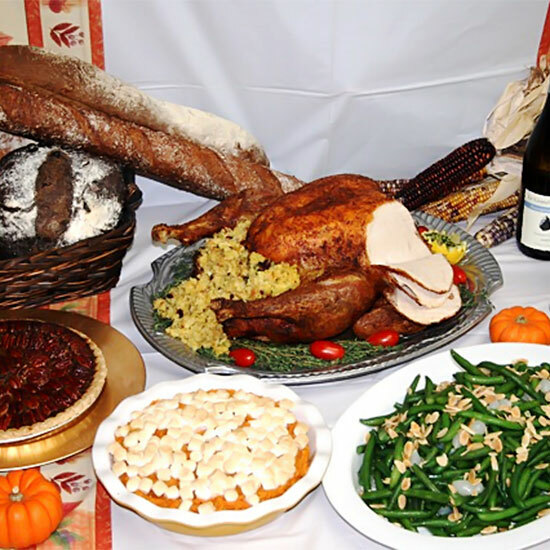 What to Order: Meals ($110–$430 for 2–12 servings) that include cooked or oven-ready turkeys, soft Parker House rolls and corn bread stuffing. fox-obel.com. What to Order: Whole roasted turkeys ($6.50 per lb), green bean almondine ($10 per qt), brussels sprouts with lardons ($10 per qt). seldelaterre.com. 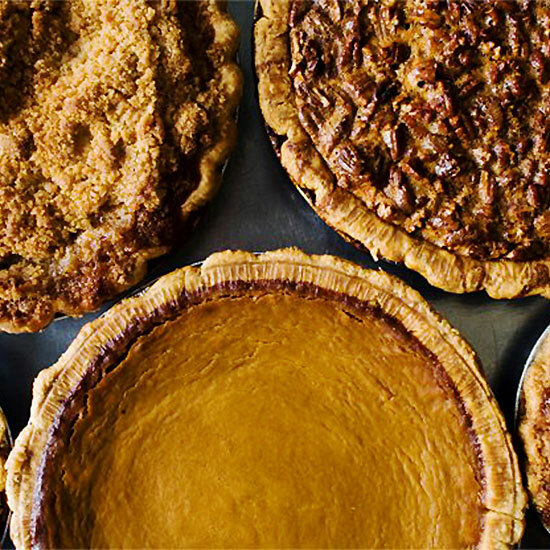 What to Order: Maple-glazed, local butternut squash ($4 per qt), fennel sausage stuffing ($12 per qt) and unbaked, all-butter pie crusts ($6). southendformaggio.com. 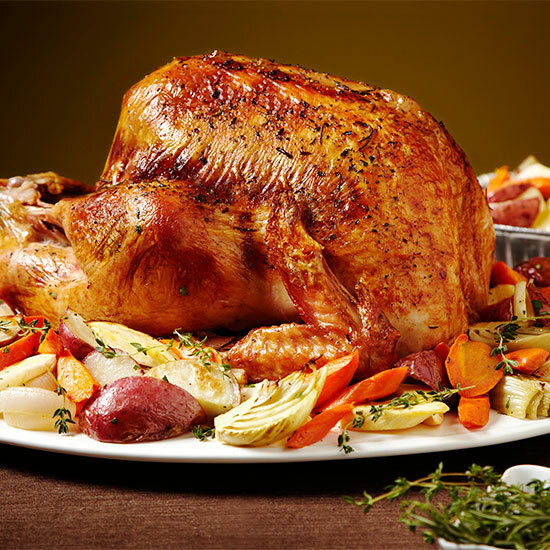 What to Order: Herbed turkeys ($77–$160 for 13—27 lbs), broccoli casserole ($10 for 3–5 servings) and garlic mashed potatoes ($10 for 3–5 servings). joannasmarketplace.com. What to Order: Meals ($88 for 12 servings) that include stuffed turkey, Cuban-style black beans and cranberry sauce. lacarreta.com.